We are currently in production for the 2015 Spring/Summer Wedding Issue right now and time is of the essence. It will be on stands Thursday, April 2. 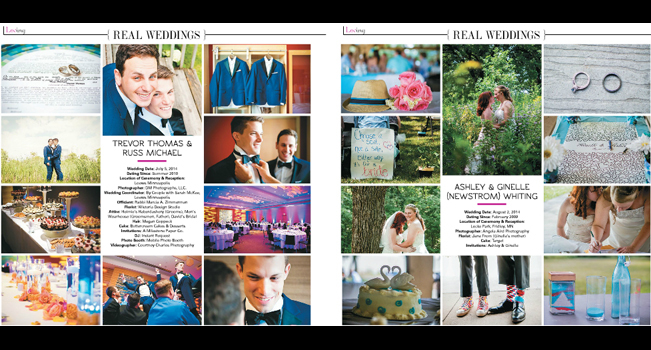 If you have a wedding that you have been a part of (and are now a newlywed) or that you’ve shot as a photographer, please consider submitting your Real Wedding for Lavender’s Wedding Issue. We look forward to receiving your projects. Note the deadlines below: Photography, release form, and questionnaire must be submitted electronically by 11:00am, Monday, March 2, 2015. All events must have occurred since our last wedding issue (Fall/Winter). Anything since October 30 of 2014 is acceptable. You may submit 5-12 photos from the SAME EVENT with the SAME GROOMS or BRIDES. They must be 8.5 x 11?, 300dpi, CMYK, and either uploaded via Dropbox or via a zip file that you send me the link to–electronic download is key, with such a fast turnaround. Send or specify andy@lavendermagazine.com as the recipient. Send a follow-up email to andy@lavendermagazine.com to inform that the project is online and to receive a release form for you to sign. Finally, please submit the following mini-questionnaire about the event. Feel free to pass it on to your brides or grooms for them to answer but keep in mind that time is of the essence. This questionnaire and the photos must be in to me by 11:00am, Monday, March 2, 2015.